This modern house with fireplace is located on the edge of the friendly village of Groet, a stone's throw from the beautiful forest and dunes. In the tastefully decorated living room, the cozy fireplace ensures snug warmth on cooler days. 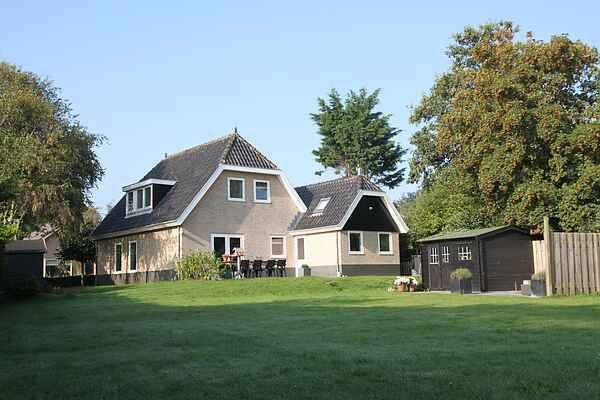 From the large dining table, you will have a view of the spacious garden and the Noord-Hollandse polder landscape . The kitchen is fully equipped. In the mornings, you can enjoy your breakfast at the wooden dining table in the garden. On warm summer evenings, light the barbecue and stay blissfully outside until the early hours of the morning. You don't need to be stuck in traffic for a day at the beach; the beach at Schoorl aan Zee or Camperduin is just five minutes by bike! Even closer, just two minutes away, lies the Noord-Hollands dune reserve with an extensive network of hiking and biking routes. The village of Groet has several restaurants, where after a long walk or bike ride, you can have lunch or dine. Art and culture enthusiasts should not miss a visit to the artists' village of Bergen. It is also nice to visit the city of Alkmaar with its cheese market and the Hollands Kaasmuseum.